Boarding the plane, it was still surreal that in about a day, I would be in Peru. Even on the plane, I wasn’t fully aware of the weeks to come. It wasn’t until our first full day in Peru that I got my first glimpse of the Andes. Arriving in the town of Huaraz, we took our first breaths of the thin air at 10,000 feet. Looking around, we were surrounded by both the Cordillera Blanca and Negra with peaks up to 20,000 feet. 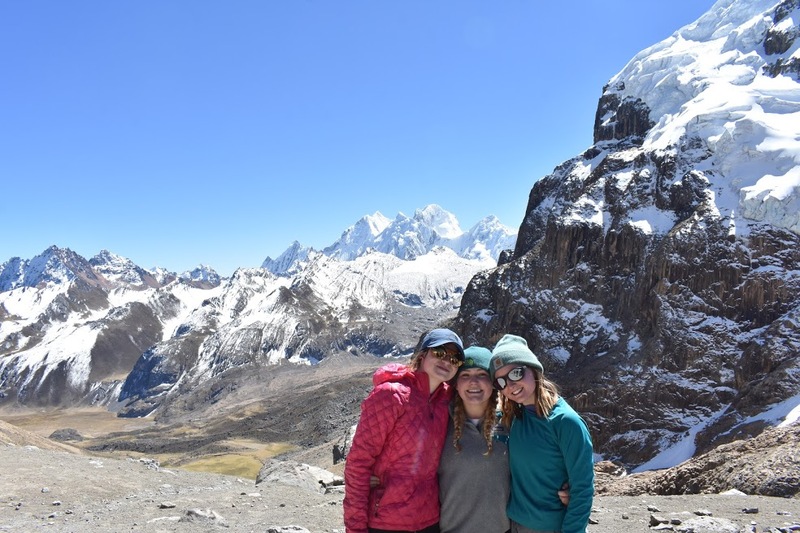 Our first few days were spent in Huaraz acclimating and preparing for trek. 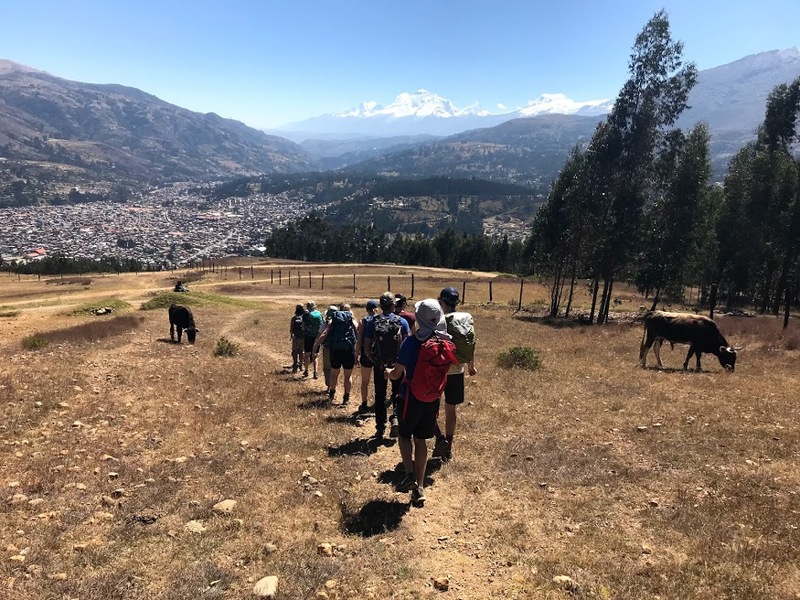 We took one hike up to a ridge above the city of Huaraz where we learned about the history about the pass we were standing on and how children would walk this somewhat strenuous trail every single day just to get to school. Our second day was spent traversing the hillsides of Huascaran National Park. Our destination for the day was Laguna Churup, a beautiful bright blue lake deep in the hills outside of Huaraz. Little did I know that the mountains I had sketched the day before would be the ones I would be hiking to the next day. 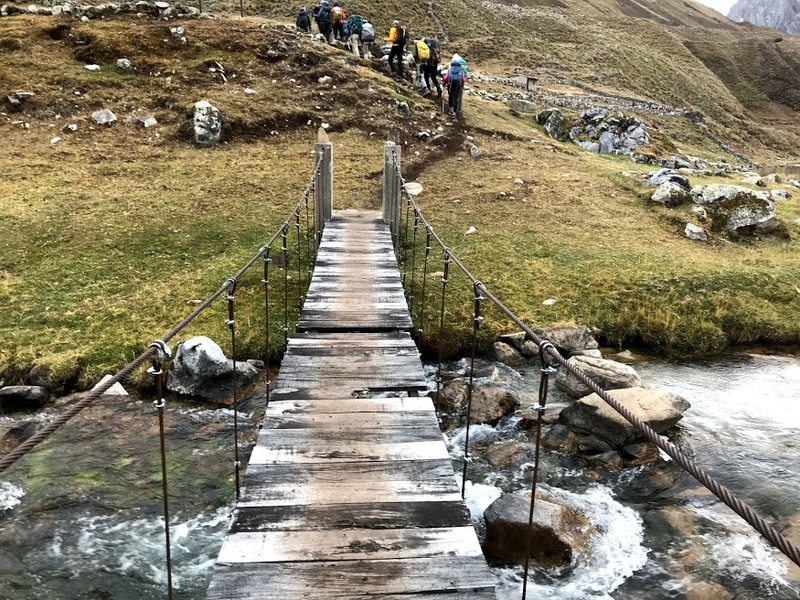 Following our second day acclimating in Huaraz and a nice sleep in, we were ready to begin the trek, but not without another long and windy bus ride.The first day of the trek was more of a bus ride but nonetheless, we were in the Cordillera Huayhuash. Our first evening in Quartelhuain was spent watching the sun set and adjusting to expedition life. Waking up the next morning was quite refreshing, with the cool mountain air blowing and a nice layer of frost on the ground. Rising higher and higher into the mountains, we kept climbing until what seemed like forever, but that would become the new normal. About half way every day, the herd of 30 donkeys carrying our duffels, tents, and food would pass along with several donkey drivers. Every day (except for one) would also consist of a pass. The passes went as high as 5000 meters. I personally looked forward to each pass because around each one was almost like a new world, a new set of mountains, different plants and terrain. It is almost impossible to sum up such a diverse landscape in such few words. Some campsites had large blue lakes, while others were dry and desert like. And the trail we walked on was just as diverse shifting from rocky to herd trails to dried up bogs. On the trek, my two favorite moments were at the tops of passes, my first favorite pass was on day 3 and looked down on a trio of lakes called Laguna Quesillacocha. The three lakes varying in shades of turquoise and blue were dwarfed by the Huayhuash’s highest peaks. On the way to the top of the pass, there was a large calving event that occurred above one of the lakes creating a loud roaring noise and a stream of ice for over a minute that left everyone in the group speechless. It was such a special moment because we had heard similar noises from the campsite the night before, but had never actually seen one, even our guides were impressed by the magnitude of the ice fall. My other favorite moment occurred several days later after getting all set up at camp 6, were had the option to go up to a nearby pass. Not knowing much, I decided to join because I wanted to see as much as I could on this trip. This little side trip was anything but. After following a dirt and mud slope for an hour or so, we hit the unexpected snow line. All of us were in trail runners, so kicking steps was a little wet, but reaching the top was like nothing I’ve ever seen before. In front of us was Yerupaja, Siula, Sarapo, and Jurau, all peaks near or above 6000 meters. 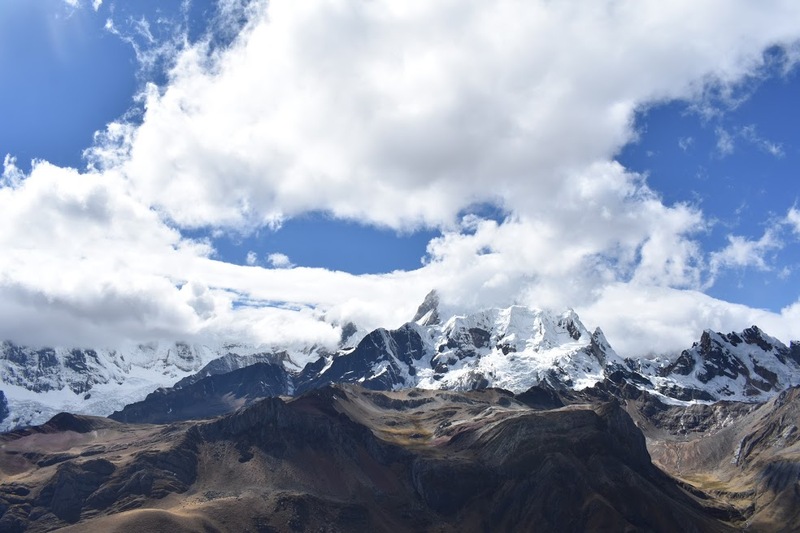 Standing on top of the ridge was very surreal for me because when I was first told about the Peru trip, I searched Cordillera Huayhuash and the images that popped up were the exact scene that I was currently looking at. The top of the San Antonio, at over 5000 meters, is a moment I will never forget. It sounds cliche, but the images and memories are still vivid in my mind, clouds rushing over the peaks, spots of sun drifting through the valley, and of course, incredible friends to share the moment of awe with. My least favorite moment on the trip was when one of our own, Scottie was forced to leave the trek because of his worsening condition. He was evacuated by horse, car, and bus on day 5 and Ian Wayne joined him. Losing Ian and Scottie was a loss for everyone because we knew they wouldn’t get to see half of the sights on the trek, but it was for the better because we later learned that Scottie was developing HAPE or a buildup of fluid in the lungs and had spent several days in the hospital following his return to Huaraz. Also on the trip with us were two incredible advisers: Ian Wayne and Sarah Wolf, both of whom I had little relationship with prior. And of course, Peter Green was also on the trip, but as many of you know, you could write an entire book about him, but major thanks to Peter for organizing this trip. Prior to Peru I had heard great myths about the legend that Ian was and I had briefly met Sarah at a meeting. We actually met both advisers in Peru as they had their own flights and had to meet up with another member of our group. Instantly they each had their own unique traits that popped out at me and throughout the rest of the trip I developed relationships with both advisers. Eighteen thousand, eight hundred and eighty feet. At more than half the elevation of a cruising 747, standing at the summit of Nevado Pisco in the Cordillera Blanca was indescribable. My only true summit with the Post this climbing season has been Old Snowy, a staggering 11,000 feet below Pisco. Nevado Pisco checked off a lot of first for me: first glacier climb, first alpine start, first rope team, and my first time front pointing. 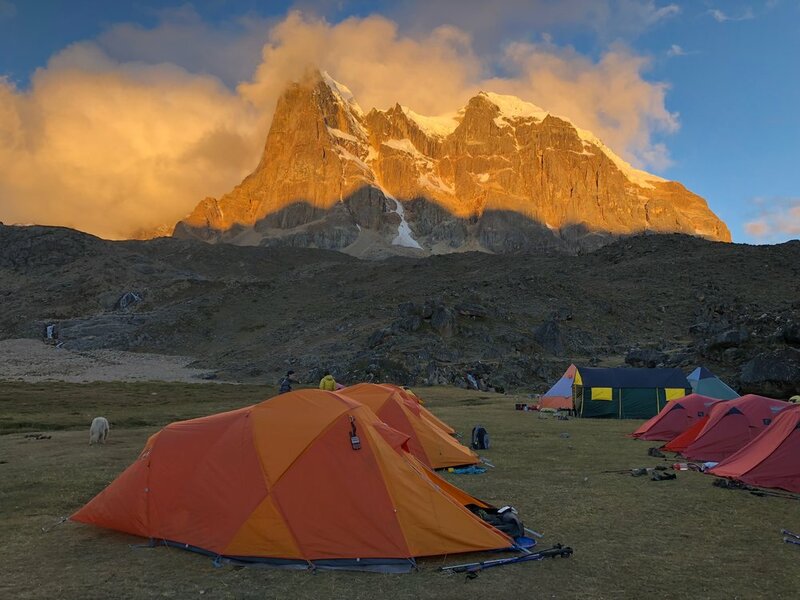 Nevado Pisco was a 4 day climb and was relatively easy. On the approach/climb it snowed every single night, waking up to a beautiful blanket of snow covering the ground. 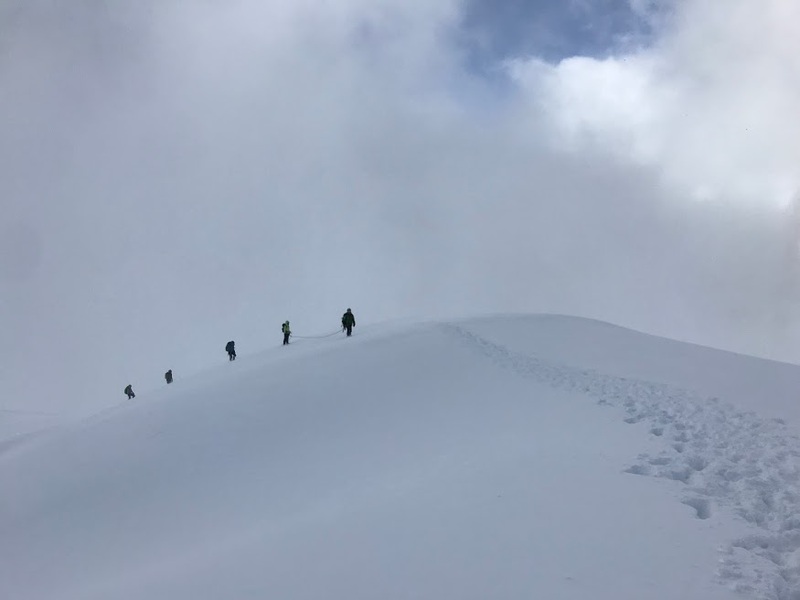 In fact, in the early morning hours of the day we had planned to summit, we were sent back to bed for an hour because of how hard it was snowing. After an hour, we arose to light flurries, but nothing unmanageable. All of us were suited in several layers of pants and several jackets. The route was simple: scramble up to the glacier, navigate crevasses up to the col, and it was more or less a straight shot from there. All in all, my rope team managed to summit in 4 hours. My rope team was the first group out of camp at 2:30am followed by the rest of the illuminated dots. Being the first group, we were pacing ourselves upon the fast approaching dots behind us. As the darkness gave way to light, we could finally get a glimpse at the mountain we’d been walking on for several hours, including the fast approaching summit above us. Before cresting the summit ridge, we had one final test. We had to cross a 2-3 foot crevasse jumping uphill above 18,000ft. Managing the ropes was the most difficult part about it, making sure your partner’s rope didn’t go taut. After a rather exciting moment at the crevasse, we were soon at the summit. There we realized that the climbers behind us were not with Post 58, they were a large group of Italian climbers. The summit of Pisco was a bit underwhelming with the lack of any view, but the following events made up for that. As we were celebrating our own summit, the Italians began forming a circle and before I knew it, they were starting mass. Yes, you read that right, catholic mass at 18,000 feet. Being Catholic, I decided to partake along with the rest of my rope team. About 10 minutes in, they asked for Marcell Simon’s water bottle, thinking nothing of it, he complied. Several minutes later his water was being blessed as the holy water. The climber reciting mass wore a stole, read from a book of prayers, and even brought his own small chalice. He even gave communion to all who were religious, including myself. As the hour long mass was wrapping up, the other rope teams from our party finished their ascent and we celebrated together. After standing on the summit with little sun, heavy winds, and spin drift for a little over an hour, we descended where just below the clouds, we saw views into more of the Cordillera Blanca. The descent was rather quick and before we knew it, we were back at our first camp, myself sleeping. Following our climb, we had several days in Huaraz to explore the town, markets, and fair. A favorite by many was the shaved ice in the town square. The markets in Huaraz included a multitude of handmade goods, where many purchased alpaca sweaters. When the sun set, a large group of us decided to go to the fair and ride the scariest amusement park ride. Shaped like a circle with a bench along the inside, with no seat belts and simply a small metal railing to hold on to, the operator would spin, shake, and jolt the riders every which way until many people were in the center holding onto nothing. The fair could not have wrapped up the trip any better, as our final day we found ourselves holding on to much of the trip as possible before our departure.